The Kadosh cheeses are one of the town's best-kept secrets. The Kadosh family has been making cheeses in their small dairy on the edge of the Old Jewish Quarter for over 100 years, using the same methods of cheese-making as their ancestors did several generations ago. 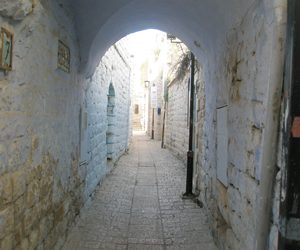 The Kadosh family established its presence in Safed when the present owner's great-great-grandfather walked to Palestine from Morocco at the end of the 19th century. He was 12 years old and wanted to make cheeses so to learn the art of cheese-making, he wandered through local Arab villages, watching the women make cheese. He settled in Tzfat and established his dairy next to his house, just off of HaAri Street, above the section of the cemetery which, after 1948, became the military cemetery. Today Kadosh cheese makes both goats' milk cheeses and sheeps' milk cheeses. The process that the family uses to make the cheeses is the same as that used in the 19th century when the dairy first opened. The cheeses are left to ripen in straw baskets in the cheese cellar below the dairy. The straw adds flavor and serves as a purifying agent. These baskets were once woven from reeds which were harvested in Wadi Amud, the valley below Tzfat, but today they are commercially made. Kadosh cheeses has both hard and soft cheeses. The hard cheeses age anywhere form 6 months to 3 years, depending on the type of cheese. There are numerous varieties of cheeses and other dairy products at the Kadosh dairy including hard and soft Tzfat (salty) cheese, cheese marinated in Merlot wine, kashkaval cheese, goat's cheese, bulgarian cheese, ricotta cheese, goat's milk ice-cream, labana (a creamy sour cheese), yogurt and camambert cheese. The dairy also produces additional delicacies such as stuffed vine leaves, local wine, olive oil and the famous Kadosh halvah (a desert made from tahini). There are a few tables and chairs right in the dairy for visitors who wish to taste the cheeses or buy a meal. A popular item at the Kadosh dairy is a large “laffa” -- flat pancake – which is spread with labana and drips with olive oil with vegetables served alongside. The Kadosh dairy is located on Yud Aleph Street.